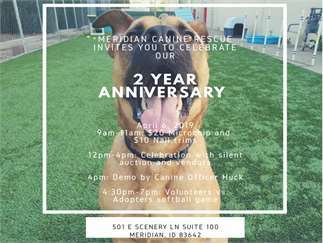 Please join us as we celebrate 2 years of puppy kisses at MCR! The party starts at 12pm. Your own animals are welcome to stop by that morning for a microchip or nail trim, but during the party, we kindly ask you to leave your furry friends at home so we can showcase our rescue pups -- unless of course you're a prospective adopter interested in taking home one of our dogs. 4:30pm-7pm: Volunteers vs. Adopters softball game . ADOPTIONS will take place during our normal hours, 12pm-5pm with a reduced fee of $250. All meet-and-greets and adoptions must be completed during this time, so if you are interested in adopting a dog in foster, please call 208-794-0944 to make an appointment. DUTCH BROS will be on site all day for all of your beverage needs. The Rusty Dog will be there to fill your tummies with corn dogs.